Enter a world of haunting power and dark psychedelia. 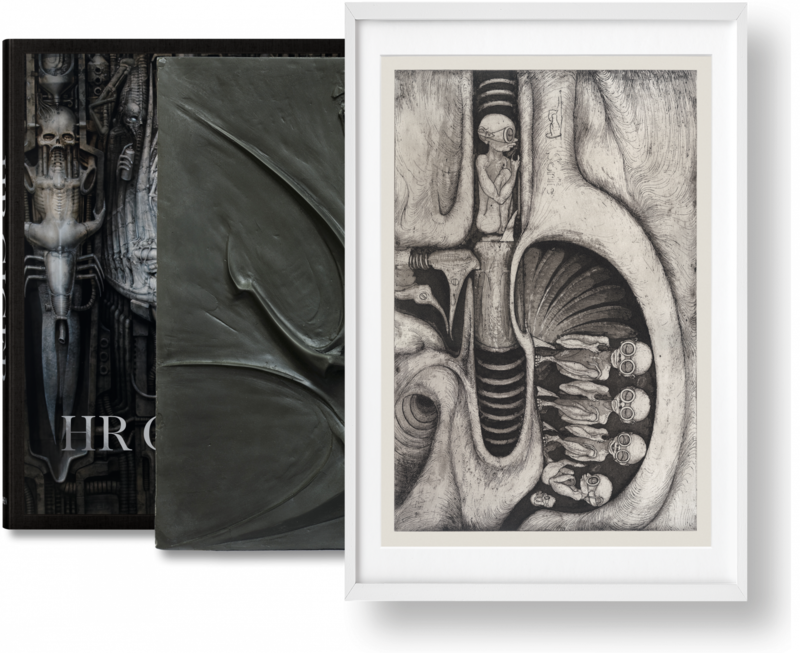 From atom bomb anxiety to Ridley Scott’s Alien, this SUMO-sized Art Edition pays tribute to the biomechanic vision of HR Giger in painting, sculpture, film work, iconic album covers, and his unique artist’s museum. 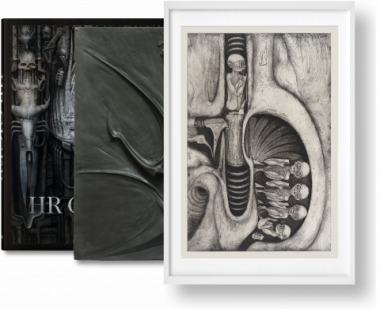 The volume comes with the ready-to-hang relief Untitled (1964), and the photogravure Gebärmaschine (Second state), a 1965 version of one of Giger’s most iconic motifs. 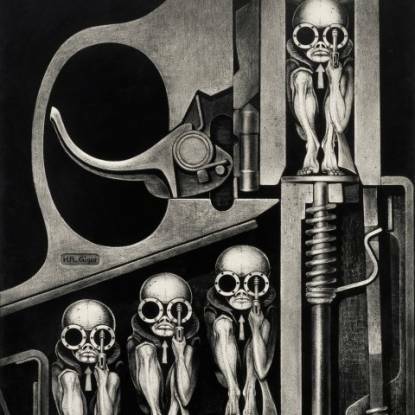 The volume is presented with the photogravure Gebärmaschine (Second state), showing armed babies loaded into an at once intrauterine and revolver-like space. 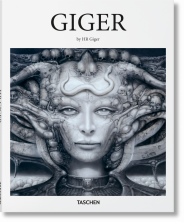 The image is one of Giger’s most important motifs, revised and revisited continually between 1964 and 1967. This particular version was etched in 1965 and has never been printed before. The accompanying ready-to-hang relief cast from an original polyester sculpture created by Giger in 1964. It combines two of the big interests of the artist’s early career: tachist painting (the European version of Abstract Expressionism, often characterized by calligraphic brushstrokes) and interior design. His abstract painting and design models in polyester come together in this fascinating piece, where skeletal forms already show promise of the gruesome creations of his later oeuvre. Art Edition (No. 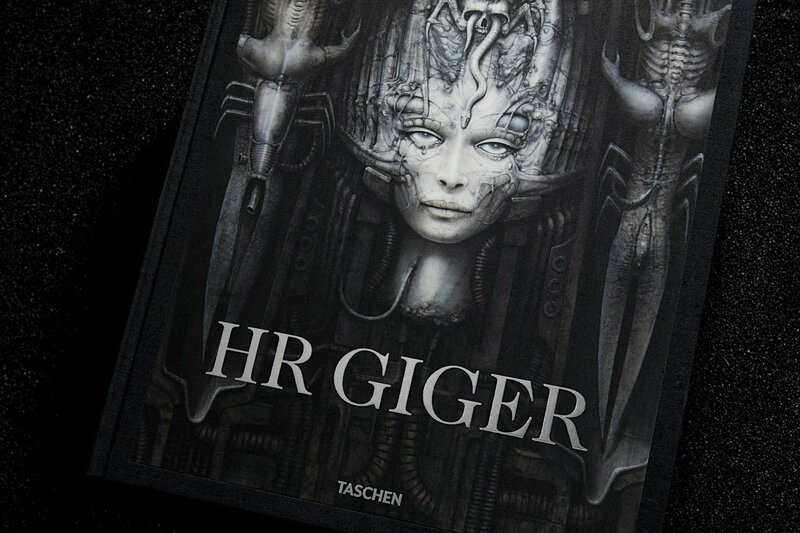 1–100) each signed by Carmen Giger / HR Giger Estate. 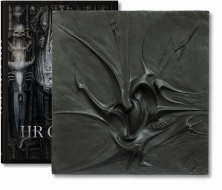 With the cast relief Untitled (1964), and photogravure Gebärmaschine (Second state) (1965/2016), both authenticated by Carmen Giger / HR Giger Estate. Also available as an additional Art Edition (No. 101–200) with the cast relief Untitled (1964), and as a signed Collector's Edition (No. 201–1,200). Hardcover volume with fold-outs, 14.4 x 19.7 in., 400 pages, with polyester cast relief Untitled (1964), 19.7 x 19.7 in., in a box, and photogravure Gebärmaschine (Second state) (1965/2016) on archival quality paper, 17.1 x 23.6 in.